Elizabeth Short was a star-struck young beauty whose body was found severed at the waist in January 1947 in Los Angeles. 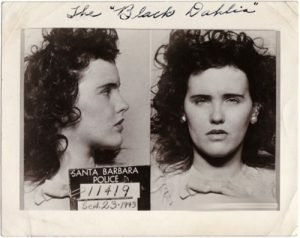 She will be forever remembered as The Black Dahlia! Her sadist murder remains perhaps THE most infamous unsolved case in the world to this day. But few people know that several other women died in similar circumstances in Los Angeles around the same time. HOLLYWOOD & CRIME, the audio series that debuts today, examines the cold cases of not only The Black Dahlia, but the other 7 women that were brutally murdered in Noir-era Los Angeles. This new true crime audio series, HOLLYWOOD & CRIME, investigates notorious crimes and scandals from mid 20th-century Los Angeles. Season 1, THE BLACK DAHLIA SERIAL KILLERS, available now on Wondery, reopens the unsolved cases of 8 women, including the notorious murder of Elizabeth Short, AKA the Black Dahlia. Their stories are told based on rigorous research and groundbreaking new and untold information. Click HERE to hear the trailer. Subscribe and listen to the HOLLYWOOD & CRIME using the podcast app on your phone. If you have an iPhone, here is the link to iTunes. If you have an Android phone, here is the link to Stitcher.